Student loan debt is soaring. 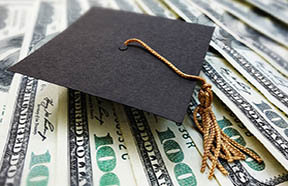 The Federal Reserve reports that more than 44 million people owe $1.5 trillion in student loans. Loan amounts average $37,172, although some go as high as $100,000 or more. The Federal Reserve reports that 6.8 million of the student loan borrowers are between ages 40 and 49 and owe an average of $33,765 each. However, those over the age of 50 are the fastest-growing group who hold student debt in the United States. Many of these individuals are helping their children pay for college. The problem probably won't go away soon. The Congressional Budget Office estimates that $1.27 trillion in new federal student loans will be added between 2018 and 2028. Some employers are stepping up to assist employees in paying off the loans. One of the biggest reasons for this benefit is the escalating competition for talent. The unemployment rate is at a near-historic low, and companies are looking for ways to stand apart by offering benefits that go beyond the standard benefits. Even though some companies are offering benefits such as sign-on bonuses and flexible hours, representatives at Options Clearing Corporation, a Chicago-based equity derivatives clearinghouse, said student loan assistance is the most talked about benefit at job and recruiting fairs. Employees report they are stressed about their loans and are anxious to pay off their debts. Human resource experts say that this anxiety can lead to reduced productivity and increased health challenges. Another problem is that young employees often put off saving for retirement so they can pay off their student loans. Federal statistics show that the average monthly payment for borrowers ages 20 to 30 was $350, leaving little for retirement plans. Natixis Investment Managers reported that annual surveys of 401(k) plan participants indicate that student loan debt is hindering millennials' ability to save for retirement. In spite of the growing number of employees who have student debt and the problems debt causes, the Society for Human Resource Management's 2018 Employee Benefits survey found that only four percent of U.S. companies offer student loan assistance, up from three percent in 2015. If you decide that student loan payoff assistance is a benefit your employees will appreciate, you should take a holistic approach. One popular option is a student loan repayment plan (SLRPs) mixed with debt education. Using a third-party vendor, employers make monthly contributions directly to an employees' student loan servicers while employees continue to make regular payments. When the monthly contribution is applied directly to the principal, it can shave several years off the loan. For example, a $100 monthly contribution on a $26,500 student loan balance at four percent interest over 10 years can take three years off the loan. Fidelity Investments, for example, uses an SLRP for its employees that pays $2,000 per year with a $10,000 cap. Fidelity also offers financial counseling and education for its employees — even those who don't have student loans. IonTuition, a student loan management and refinancing company, recommends that the foundation of any student loan benefit should be counseling and management resources. Borrowers often lack information about their repayment options, and financial counseling can help them better manage the debt. The student loan repayment benefit is still new, though, and some bugs must be addressed. Many employers find student loan programs complicated and expensive. Rules vary among student loan companies and college students often have several loans from different companies. Also, unlike credit-card companies, which provide monthly statements and minimum-payment warnings, student-loan servicers don't have to tell borrowers how long it will take to repay their loans if they only contribute the minimum payment every month. Another consideration: There is no financial benefit for employers. These payments are considered regular wages, so there's no tax benefit as there is with retirement plans, health insurance or tuition assistance. A U.S. House bill, introduced in February 2017, (H.R. 795), however, would give employers' student-loan payment more favorable tax consideration. Currently, the bill stalled in the House Ways and Means Committee. To find out more about plans like this, please contact us. The information presented and conclusions within are based upon our best judgment and analysis. It is not guaranteed information and does not necessarily reflect all available data. Web addresses are current at time of publication but subject to change. SmartsPro Marketing and The Insurance 411 do not engage in the solicitation, sale or management of securities or investments, nor does it make any recommendations on securities or investments. This material may not be quoted or reproduced in any form without publisher's permission. All rights reserved. ©2017 The Insurance 411. http://theinsurance411.com Tel. 877-762-7877.